Unique Estates's annual award ceremony was a special evening full of emotions and excitement for everyone in the company. This important moment of appreciation recognized the remarkable efforts and achievements of the team. The year was really special for consultant Daniela Tonova. At the solemn award ceremony, she received an extremely strong appreciation from the management and her colleagues, for the efforts and the results she has achieved. She won first place in the category "Consultant with the highest turnover for 2018". Together with Anna Tonova, she was also awarded the "Biggest Revenue from a Deal" for the year. 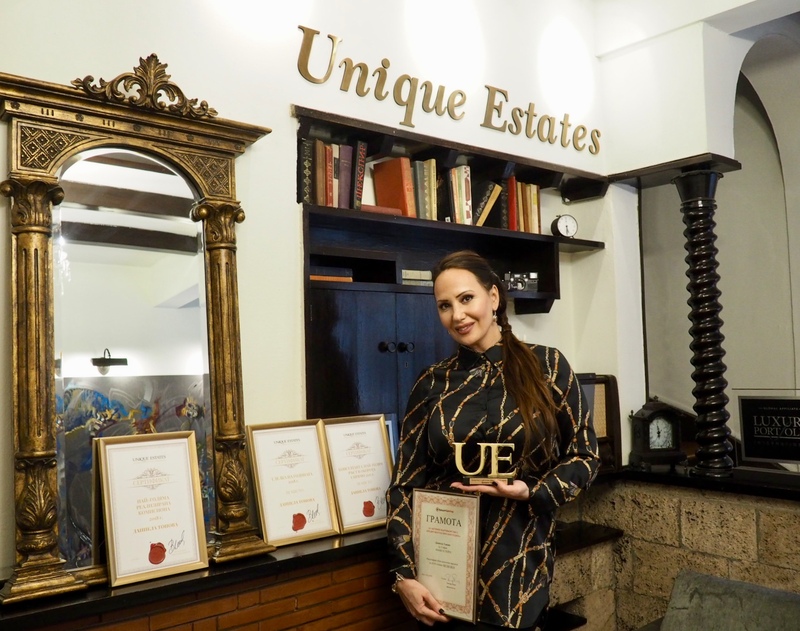 Daniela also took 3rd place in the "Deal of the Year" category for 2018 and "Consultant with the highest growth in turnover compared with 2017", as well as the "Special Prize for Active Partnership with Credit Center", "Special Prize for digital marketing "and managed to enter the Club Millionaire of Unique Estates. Daniela was also awarded a voucher for participation in the Leading RE Global Symposium 2019, which gives her the chance to take part in the gathering with the partners from Luxury Portfolio International, which will be held in Athens at the end of this year. We meet her to tell us about the emotion of the high score and achievements, the secret behind her success and her future professional plans. Despite the efforts she has put into her work during the past year, Daniela gets all these awards a little surprised. This is because the distinctions for her have never been a goal by themselves. Behind her success is the enormous love, energy and passion she puts into her work in achieving her goals. Daniela has over 20 years of experience in the field of commerce, several of them in the real estate business. The skill she has about finding the right approach to each type of customer and feeling his / her true needs is one of the most important quialities in order to be a successful trader, she says. For Daniela the conclusion of a deal is not at all costs and she is not looking for quick results in her work. She tries to find the best for the clients so that everyone is truly satisfied, for which they reward her with many recommendations and long-term friendly relationships. The highest estimate of her work is, in fact, the trust that the clients have in her and the happiness she sees in their eyes at the end of each deal. For the achievements, she wishes to thank for the support of all of the Unique Estates family - the commercial, administrative and legal departments of the company. She feels especially grateful to Svetoslava Georgieva, Chief Operating Officer at Unique Estates, who is currently her manager. She gave her the path, technology and knowledge to work with. It is from her that she gets the freedom to pursue her goals in her own rhythm, in her own way, feeling the full support and trust that has been voted on. Daniela appreciates highly the big role of Vessela Ilieva on the path of her development as a person and a professional too. She is the figure that does not stop motivating, inspiring and serves as an example for her and for everyone else in the company. With care, attention and special attitude towards each team member, she not only gives everyone the opportunity to develop but also to constantly go beyond their results. Graciela Miladinova is the person who invites her and introduces her to Unique Estates two and a half years ago, for which she is very grateful to her too. In time, Daniela does not stop ungrading her knowledge and skills with the number of trainings that take place within Unique Estates. The next month she launched a special program, and after a hard exam, she will add to her achievements a Diploma for an officially certified real estate broker in Bulgaria. For her efforts and high scores, Daniela plans to reward herself with a long journey to interesting destinations around the world, which we expect her to tell us about very soon. We congratulate her once again with the high recognition and awards and wish her to achieve her future goals with a smile on.